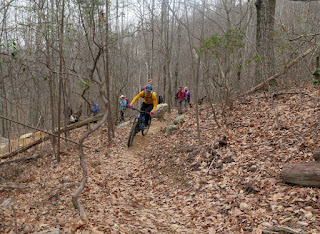 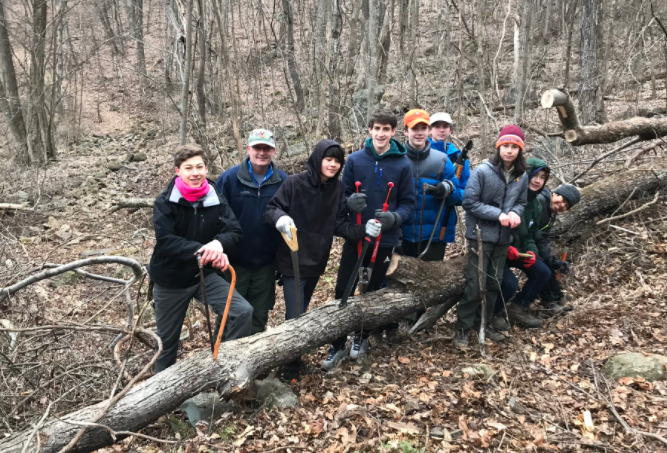 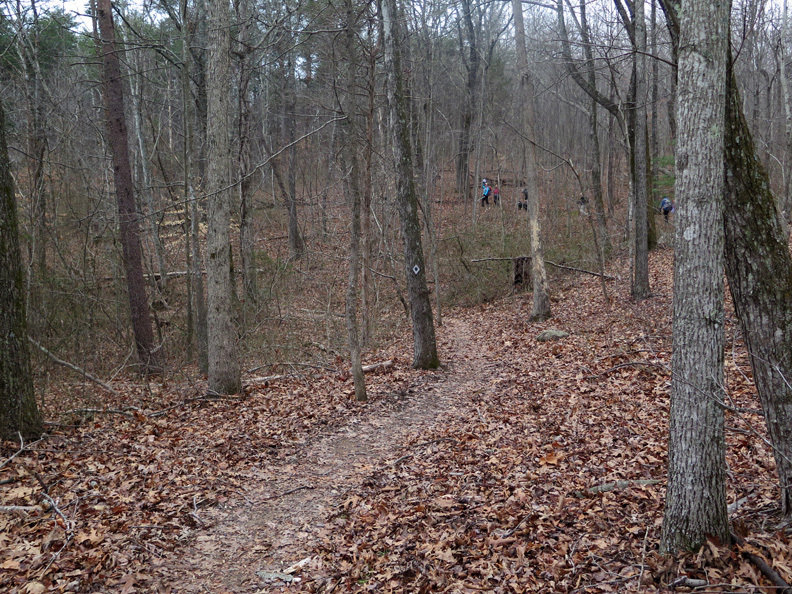 Boy Scout Troop 1437 had a great (if rainy) weekend at Conley Cabin on the PATC Vining tract. 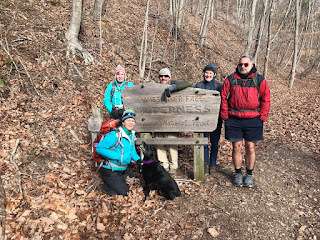 We arrived on Friday evening and hiked in the dark to arrive at the cabin around 7:30 p.m. We got a fire going, and the cabin warmed up in no time since it wasn't very cold outside. 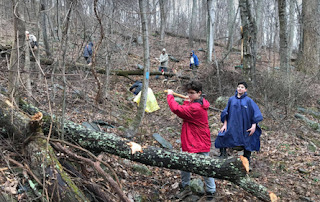 On Saturday, we went back to finish cutting a log from across the Orion trail. 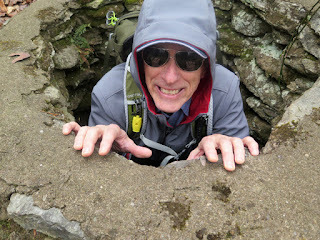 We got all the way through one side, but had to stop about 1/2 way through the other side because heavy rain came in. 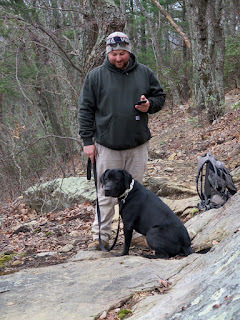 We did make it up to the Churchill Bathtub to get some water, but did not get to hike as much as I wanted because of the rain. 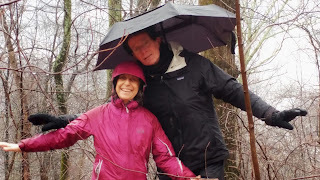 We spent most of Saturday afternoon in, and around, the cabin because of the rain. 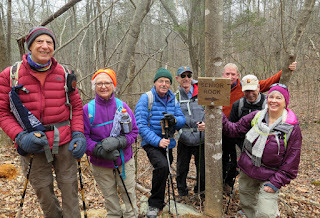 We had 11 hikers join hike leader Dan Ralston on his Preddy Creek hike. 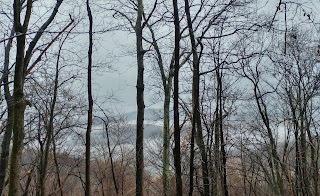 It was a very moderate and overcast winter morning but a pleasant day for a hike. 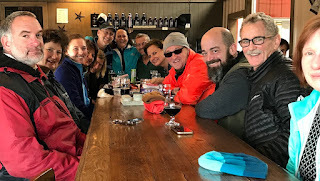 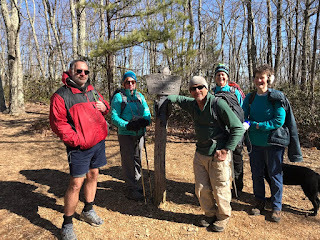 Joining the hike were Jeanne Ralston, Geoffrey Manning-Smith, Cheri Acker (a new PATC hiker), Suzanna Williams, Jeanne Siler, Lucy Hartley, Nancy Handley, Michael Seth, Charles Staples and Kelly O’Rourke. 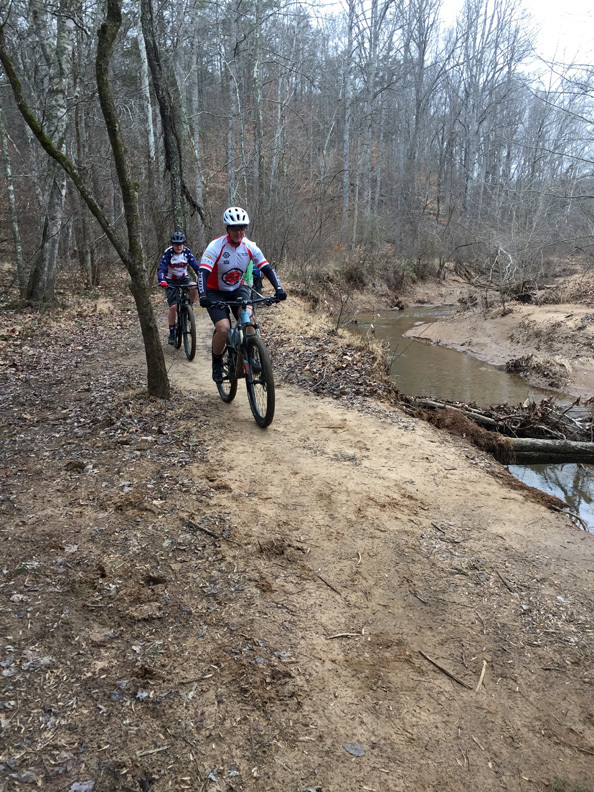 Everyone enjoyed the first loop of Preddy Creek however the new Orange County portion of the park remains closed awaiting the special use permit. 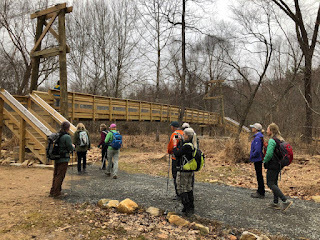 Therefore, we did not want to be a renegade PATC hiking group and trespass past the yellow tape so we just enjoyed the beautiful new bridge instead. 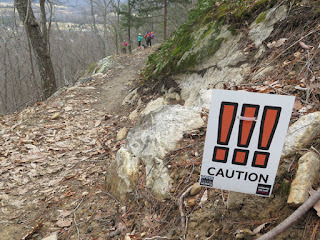 I will repeat the hike once the Orange County section opens. We had lunch in the picnic area after the first loop and then several of us did a different second loop around the park for a little added mileage. 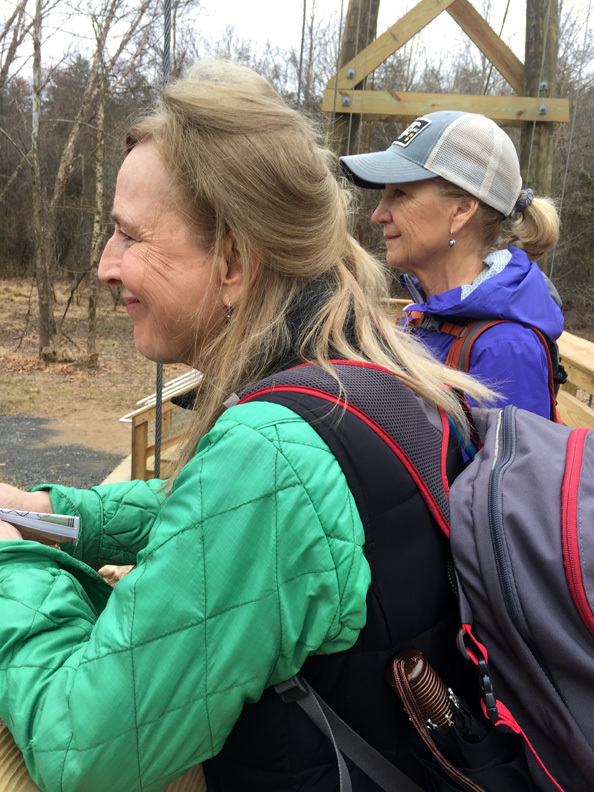 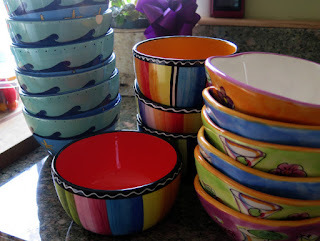 Special thanks to Nancy Handley for meeting part of the folks at AHS and also special thanks to Jeanne Siler and Geoffrey Manning-Smith for contributing the pictures. 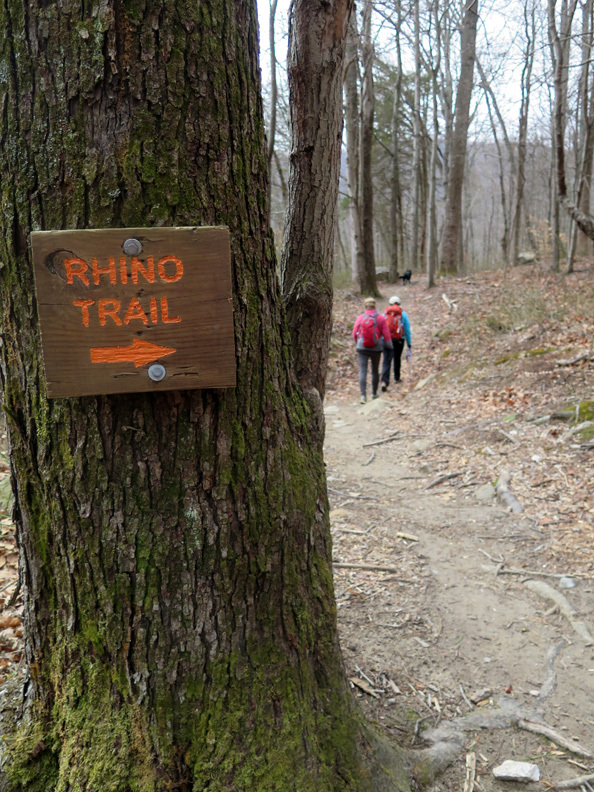 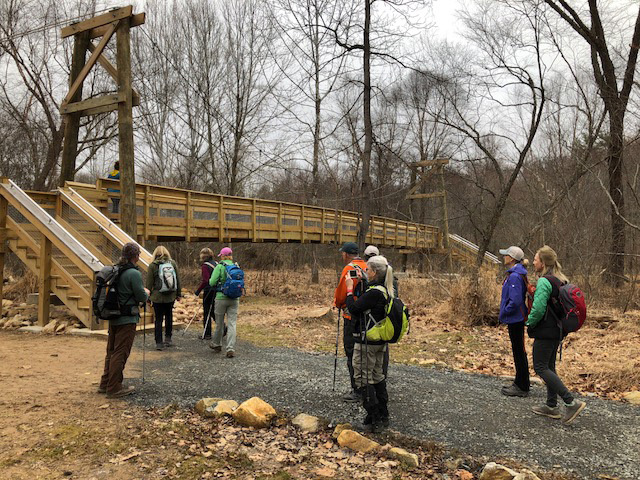 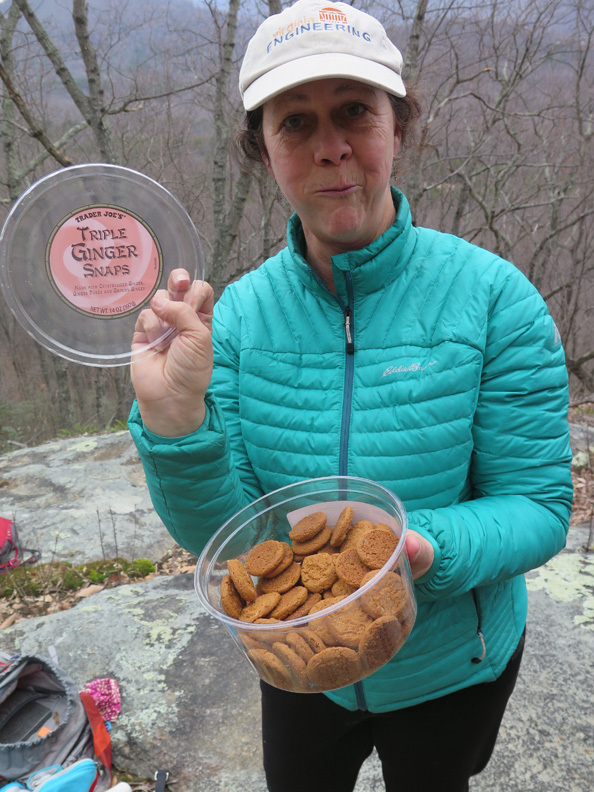 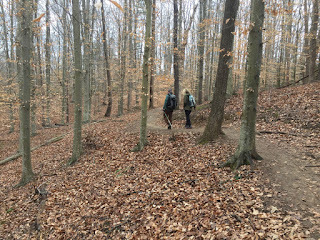 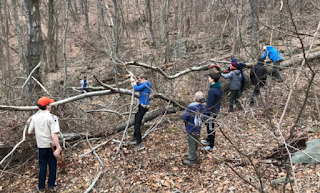 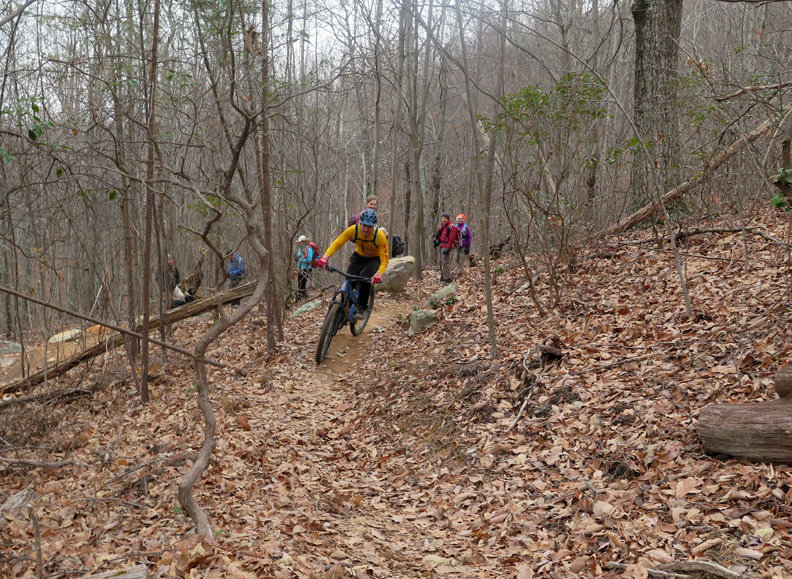 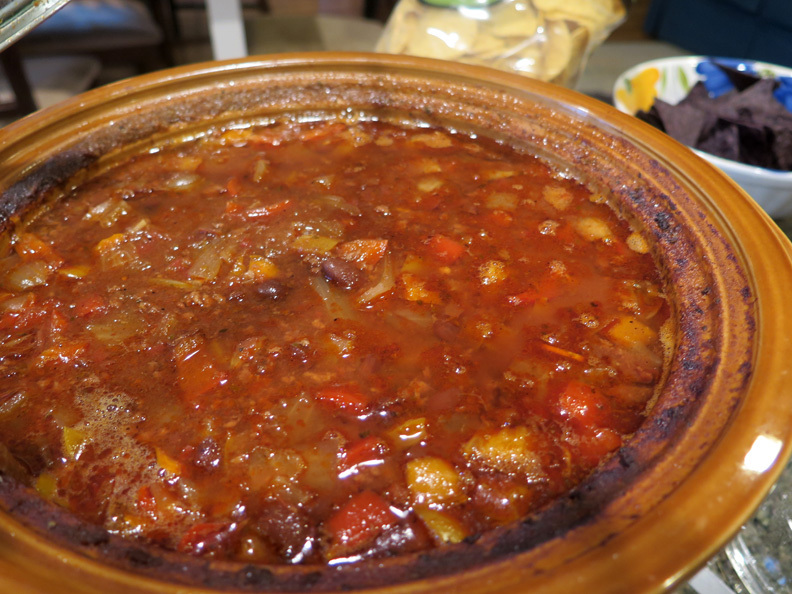 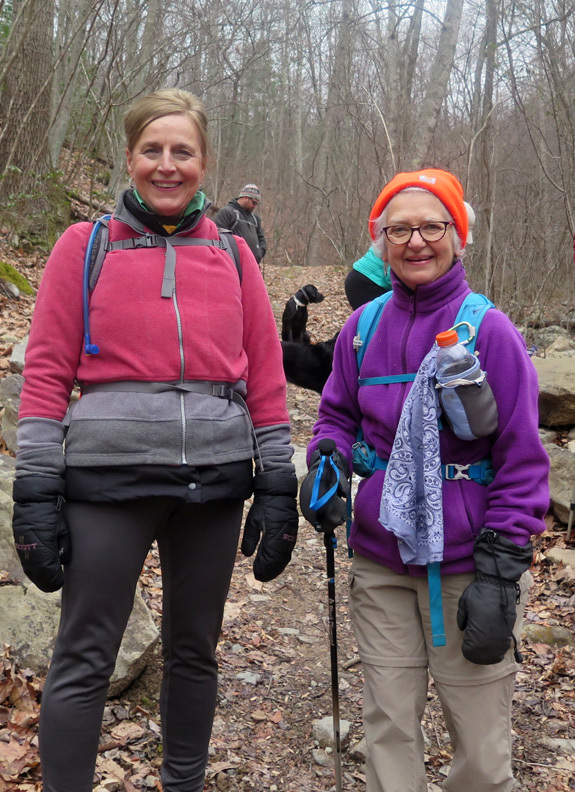 The more than 15 miles of trails at the Blue Ridge School in Dyke, Virginia, offered lots of choices for the near-dozen hikers (and two dogs) who braved the forecast and turned out Saturday morning, for Iva’s Annual Soup Hike. It helps that the Blue Ridge School for Boys is only about a 10 minute-drive from Iva’s home—and thus just before the winter precip turned into serious rain—made for a quick return to her bright kitchen full of a trifecta of warm soups and a living room with a fire in the woodstove and afternoon Olympics coverage on the large screen. 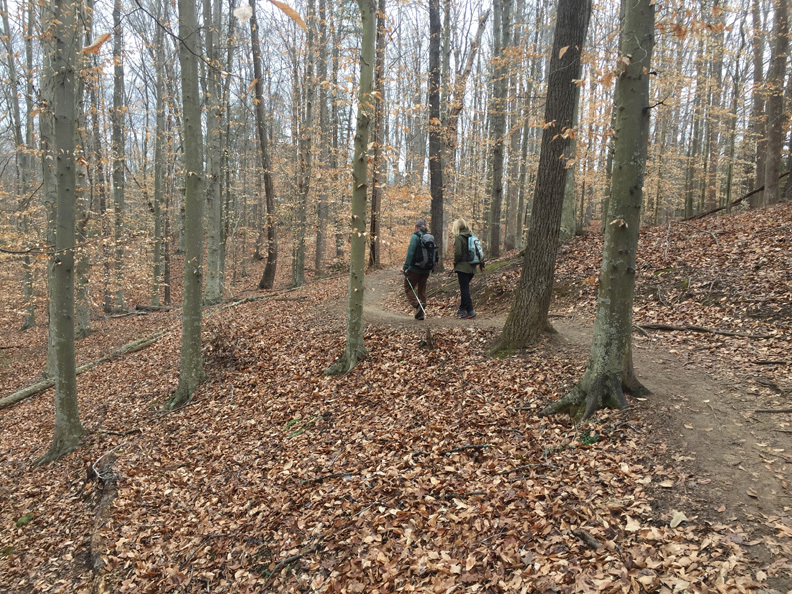 But back to the trails in Dyke. 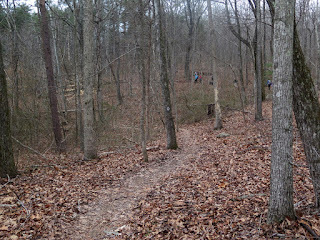 Designed with the school’s active student mountain bikers in mind, the trails, improved in both 2012 and 2017, keep steep slopes to a minimum, with lots of switchbacks. 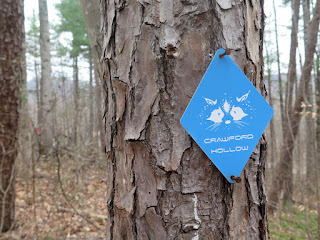 And lots of choices, with lots of signage. 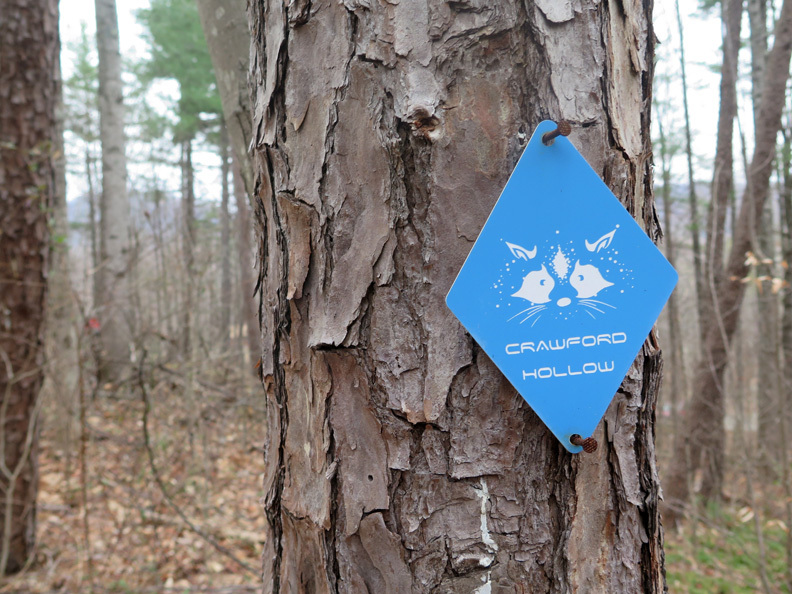 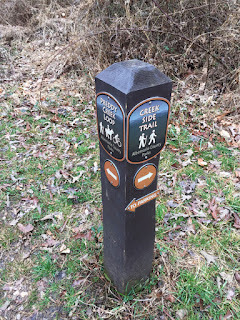 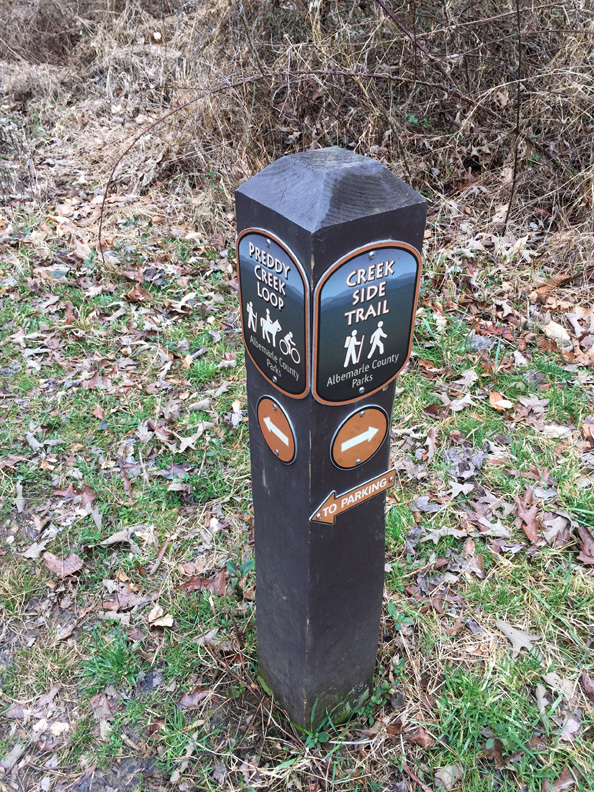 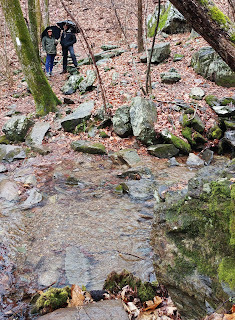 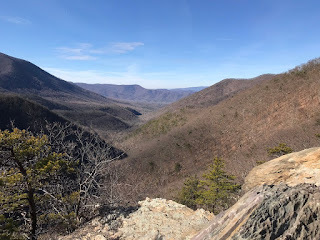 Good thing, too, about the latter, because even several experienced hikers declared the wooded areas that hug the upper hills beyond the campus to be maze-like as the trails wound up and around Bryson Hollow, Crawford Hollow, and along the Chesley Creek trail. 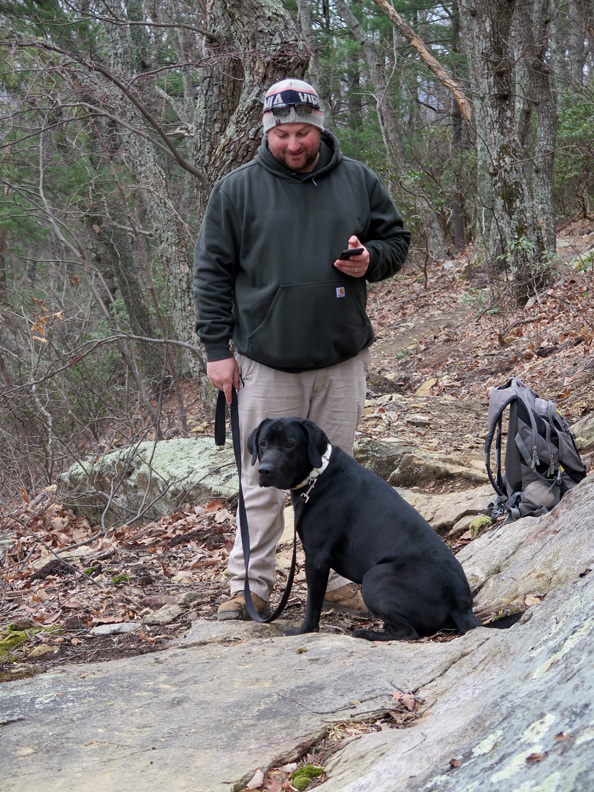 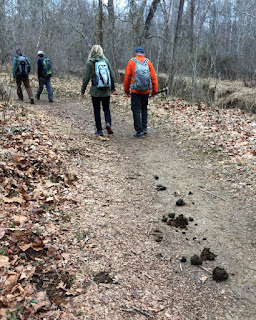 Moose the Dog (on his first-ever Iva Hike) along with Dustin (on the other end of the leash, also on his first-ever Iva Hike) saw his first-ever bicycle on the trail, though other wildlife in February tended to be limited to woodpeckers. By the time several bikers had barreled past, Moose had figured out that bikes were acceptable and stopped barking. 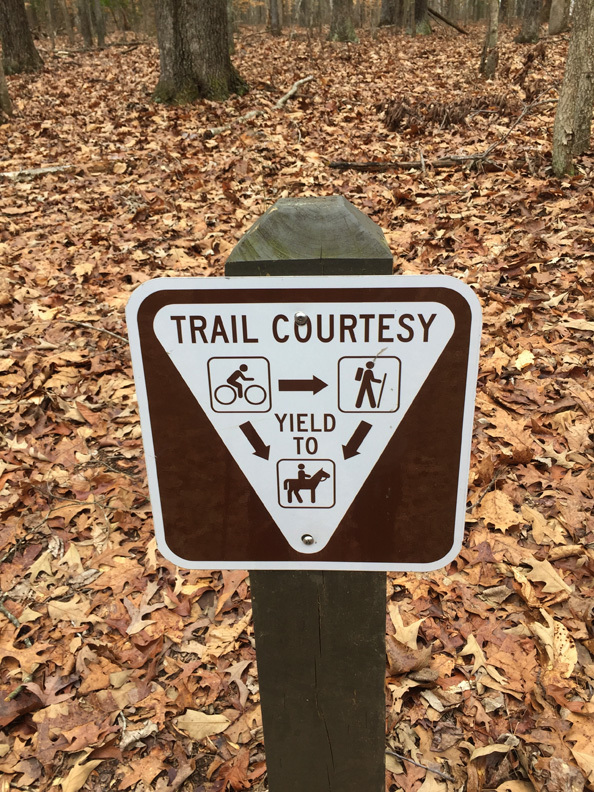 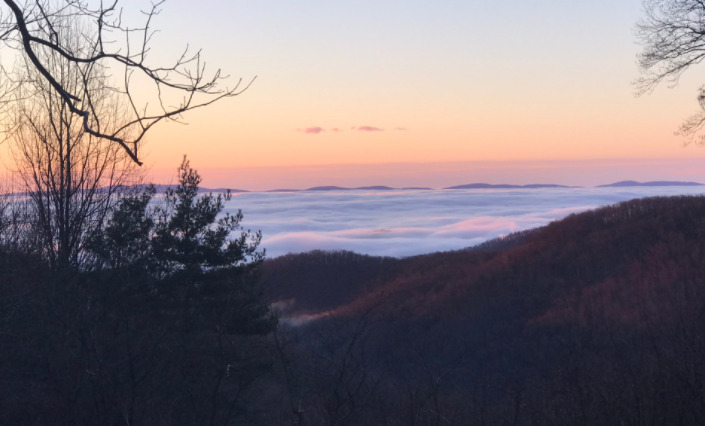 Suffice it to say, just being over the border of Albemarle County in Greene County—whether you hike or bike—Dyke makes a good destination for a quick morning or a long afternoon. 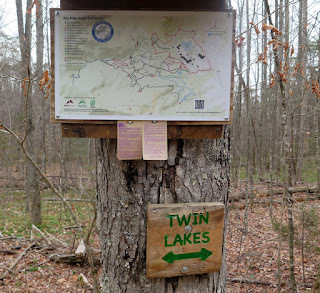 A route for a hike that would traverse Brokenback Mountain and back to Iva’s via the Moonshine Trail is already being cooked up for next year. 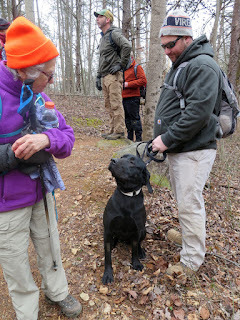 Hats off (or on, considering the weather in February) to Dave Borzick, Dustin Degnan, Bev and Pete Fink, Iva Gillet, Nancy Handley, Bill Holman, Geoff Manning-Smith, Trevor Hepler, Michael Seth, Jeanne Siler, Remy The Hiking Dog, and her close friend and most well-behaved companion, Moose. 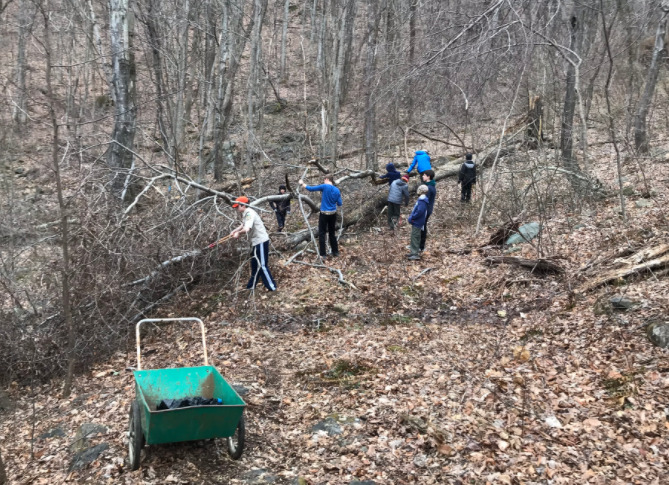 A planned hike from Braley Pond was scuttled with a rapid change in weather overnight to rain arriving in the morning rather than the afternoon and a report from Jim Fye that the Churchville area was raining and 35 degrees. 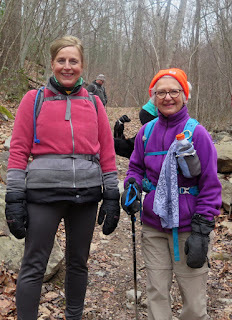 Hike leader, Barbara Martin and Andre Meyer met Nancy Handley at Rockfish Gap. 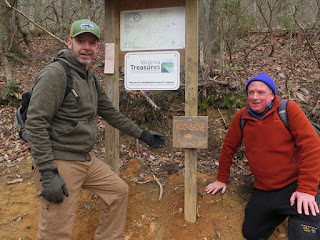 After a short consultation we decided to hike south on the AT, since Blue Ridge Parkway and Skyline Drive were closed. 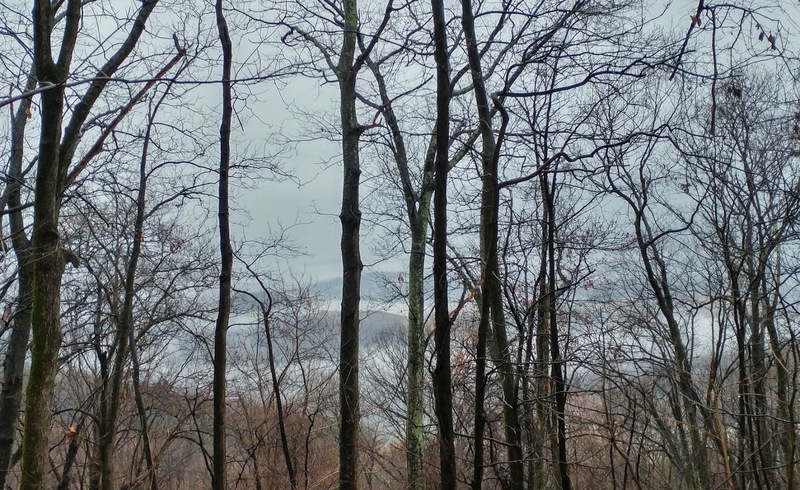 We hiked out and back about 6 miles, enjoying the foggy mountain views on the way back. Nancy and Andre experimented with umbrella hiking techniques. 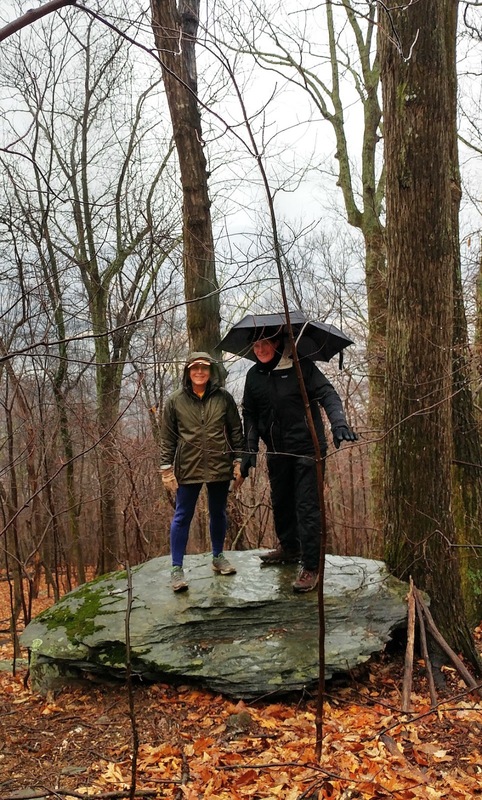 Barbara went with the rain coat and pants technique. We finished off our hike with a traditional rainy weather activity: a shopping spree at Rockfish Gap Outfitters, who were having their annual Valentine's winter gear clear out. 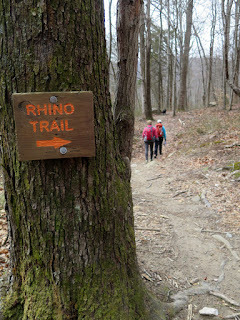 This was a PATC/RATC combined hike that never quite combined. The Charlottesville-based group picked up 2 hikers in Charlottesville, 2 more in Afton, and a 5th in Staunton on the way to the Petite’s Gap Road trailhead. 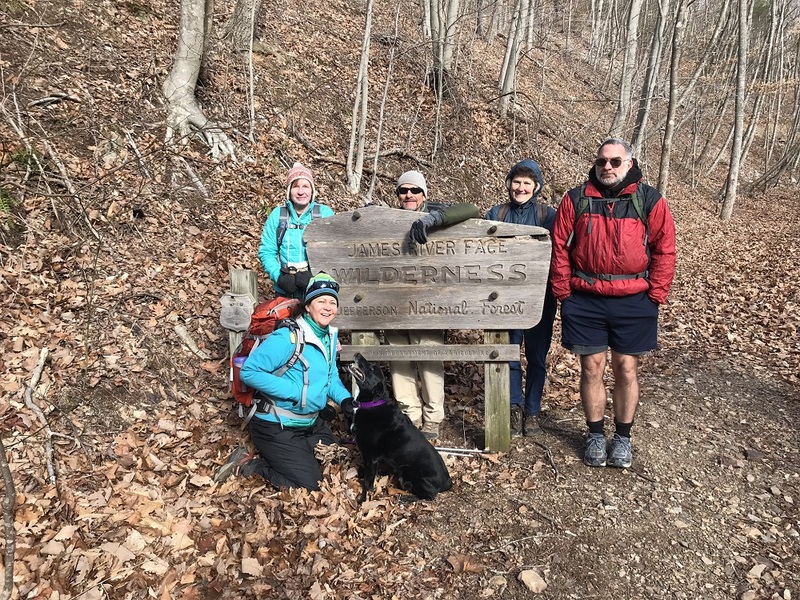 With temps that started the day in the teens, the earlier arriving Daleville group wasn’t going to wait long, and they were long gone when the Charlottesville group arrived. 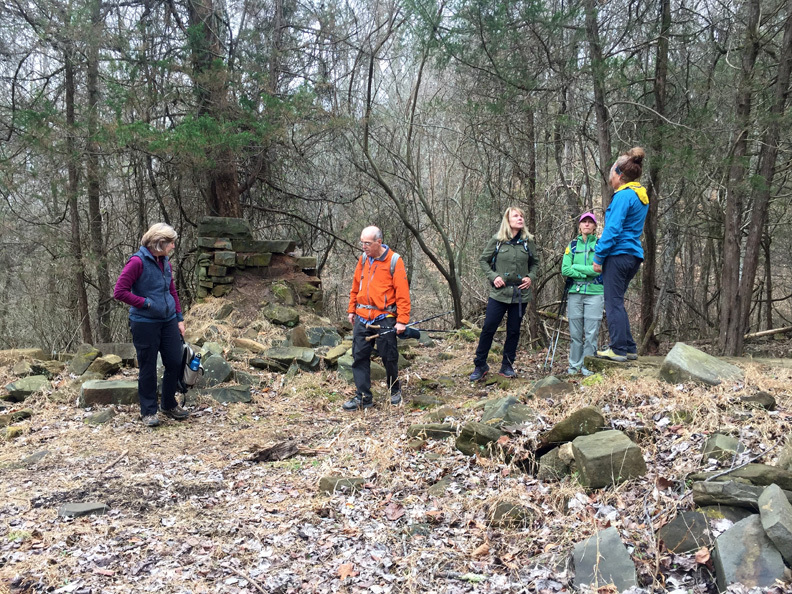 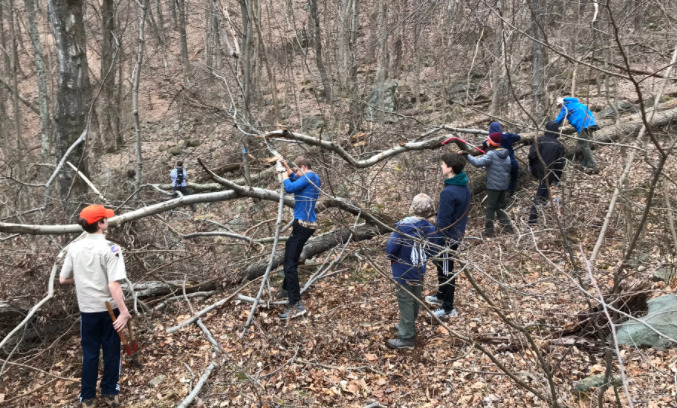 There was communication via text between the two groups, and the lead group agreed to wait for the trailing group at the Marble Springs Shelter lunch site, but the RATC hikers found that location too windy and cold to stay long. 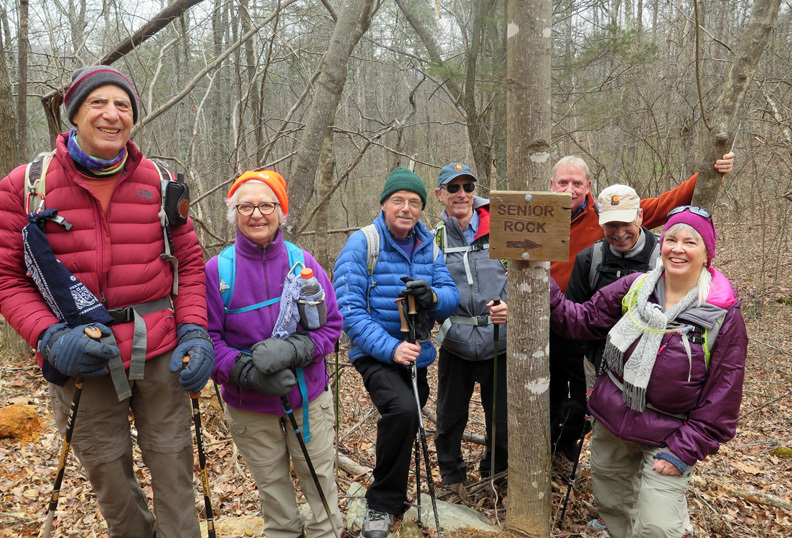 The Charlottesville Chapter hiked up the Sulphur Springs Trail to the Appalachian Trail in the Wilderness, where they found a warm sunny spot to lunch. 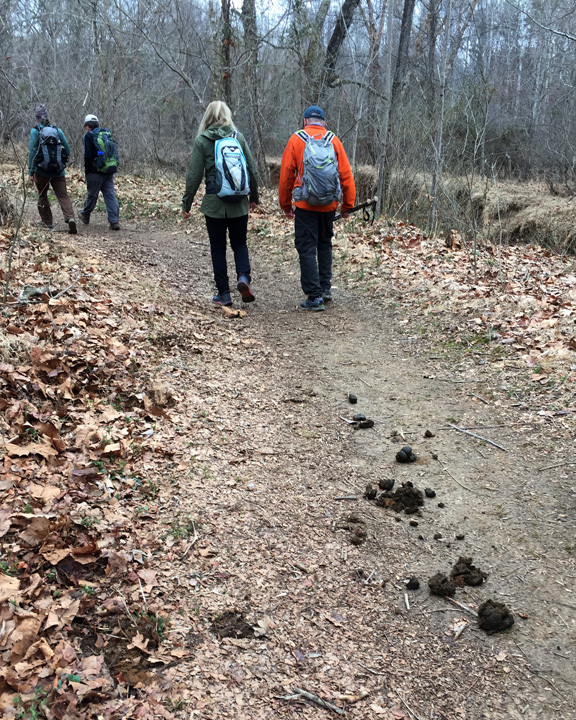 And, given the reports from the RATC about the cold nature of the trail ahead, the Charlottesville group voted to hike back down in the sun using that trail they had taken to the lunch spot. Both groups managed to convene after the hike at the nearby Great Valley Farm Brewery in Natural Bridge. 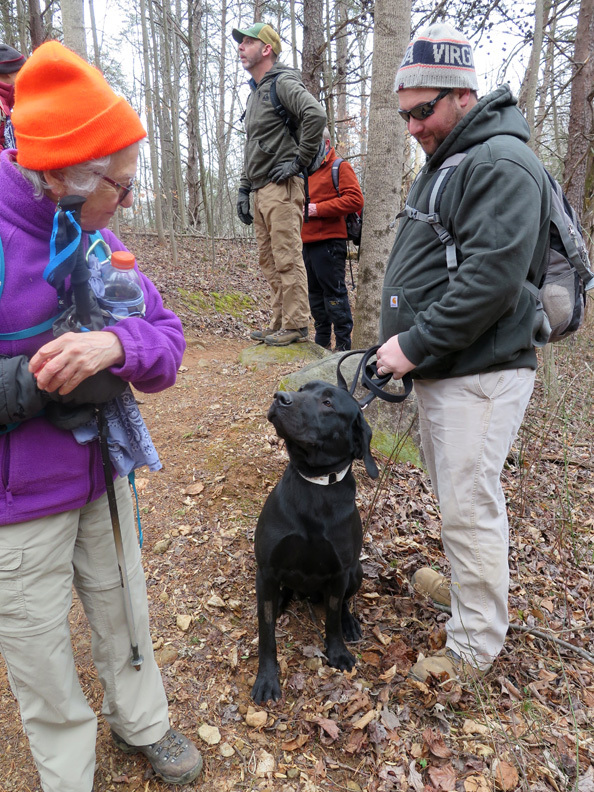 Charlottesville Chapter hikers included hike leader Jeff Monroe (3rd consecutive week as Chapter hike leader), Marian Styles, John Brandt, Iva Gillet with Remy the happy hiking dog, and SSVC Chapter members Christa Neher and Jim Fye.